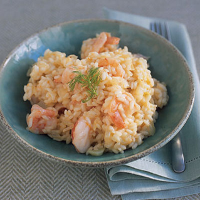 A fresh-tasting and creamy risotto is made by sautéeing aniseedy fennel and butterflied, succulent prawns. Italians never add cheese to fish, but the butter gives it enough richness. Place the fish stock in a small saucepan and bring to the boil, then leave simmering on a low heat. Heat the oil in a large saucepan over a high heat and add the prawns and garlic. Toss in the hot oil for 2-3 minutes till cooked through and pink in colour. Remove with a slotted spoon and set aside. Add the onion, fennel and orange zest and sauté for 6-8 minutes, stirring occasionally, until beginning to soften. Add the rice (vialone nano has less starch, so goes well with fish) and stir until coated in oil. Pour in the vermouth and stir until evaporated. Add a ladle of stock and stir until it is absorbed. Let the stock simmer gently and ensure the rice does not stick. Add another ladle and do the same. Repeat for 18-20 minutes or until the rice is al dente. You may need more or less stock; taste the rice to see if it is ready. Finally take off the heat, beat in the butter and stir the prawns through. Cover with a lid and leave to rest for 1 minute. Taste and season. Garnish with fennel fronds and serve immediately.